Disruptive business models and the sharing economy have already changed how we buy, sell and pay for goods and services, travel across cities, plan and book vacations, and consume all forms of entertainment from listening to music, reading magazines and books, watching TV and viewing movies. Crowdsourcing has changed how we raise cash and democratically deciding how funds get shared. But is different always better? It depends. The legal battles around pirated movies and music underscore the erosion of the ownership and copyright of intellectual property. Now Meercat and Periscope are threatening to put another category on its ear: live events. Often big events come with a brand sponsor and network broadcast rights such as the Super Bowl, which is an NFL property with broadcast rights owned by one of the networks. But what if someone from the NFL or a fan decides to live-stream? In the first instance, it’s a clear violation of contractual agreement. The network has the broadcast rights regardless of channel, whether it is old school live television or streaming via Meercat. The fan is violating copyright laws which are clearly stated to both viewers and attendees of the events. 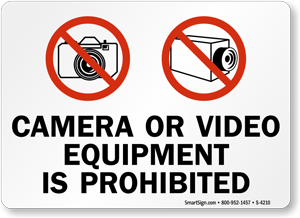 Events used to ban video cameras – and would check people at security. Now that the phone is the camera, event officials post “no videotaping allowed”. If a person is caught, s/he can get the boot. These events are not looking to police parents taping their kid for a few minutes; it’s the folks pirating a whole event and then monetizing it via their blogs, etc. It’s a very grey area – how do you know who’s who? It raises the question: will we be required to check our devices at the door? As I started writing this, a ComBlu colleague sent me this post from Jay Baer, who had been thinking about the same thing. Jay takes it further and raises issues about live-streaming conference content, Broadway plays and concerts; all of which are clearly the intellectual property of someone else. The sharing economy has brought a sense of “disruption entitlement”. People believe it is their right to use technology to not only change how we do things but also to override established governance, licensing or regulations that were intended to protect consumers and businesses as well as hold them accountable. While many disruptions have led to more efficient, effective ways to do things, we as a society need to think about how we protect the rights of all parties while still encouraging creativity and entrepreneurship.